Yess. She did it again! Green Monkie is super-proud of climbing talent Aniek Lith (who we are sponsoring by the way-if we may mention that minor detail 😉 )! 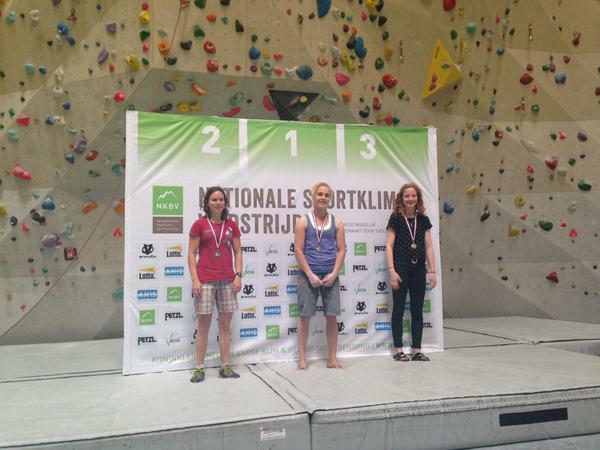 Yesterday -7th June- Aniek participated in the Leadclimbing competition (Lead2) in climbing hall Mountain Network Amsterdam. She climbed to be the First Runner Up and conquered the Silver medal!! The golden medal went to strong Nikki van Bergen and Eva Vink got bronze. The males; all time favourite Tim Reuser won first price, Mark Brand became second and Casper ten Sijthoff got the third spot.